On the 30th of January, openSUSE notified me that my membership was being revoked. and substantial contribution to the openSUSE project. to get more involved with openSUSE and then apply again for membership. As a person new to openSUSE you might check the "How to Participate"
As I am a fan of the openSUSE project and like to advocate the use of openSUSE through this website, I was quite disappointed. In 2018 I have written 15 articles about openSUSE Leap and about the various applications used on openSUSE. Fossadventures received 87.241 visits and 40.639 visitors over the last year. The RSS feed of this website is added to Planet openSUSE. 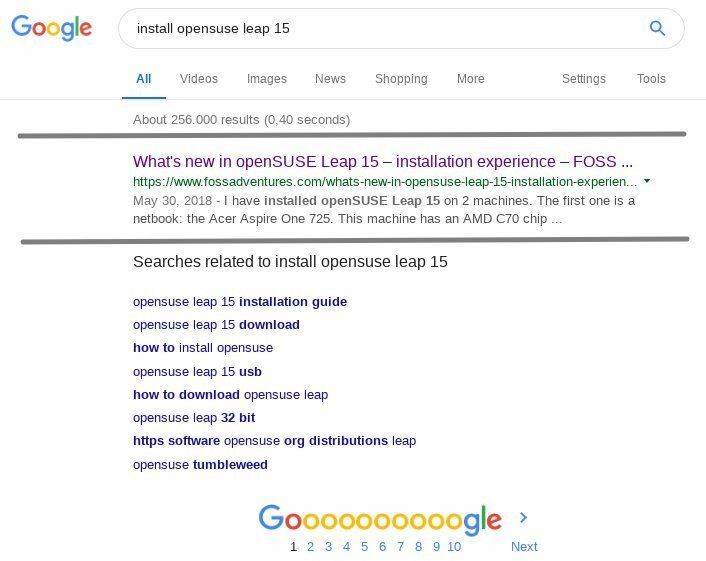 And Fossadventures is still listed on the first page of the Google search results for “install openSUSE Leap 15”. I have e-mailed openSUSE Membership Officials to re-activate my membership. I also have requested a membership (again) via openSUSE Connect. Almost 2 weeks later, my membership status has not been restored. Which means that I cannot participate in the openSUSE 2018-2019 Elections, as voting will close on Friday 15 Februari. My difficulties are not limited to staying an active openSUSE member. Becoming an openSUSE member also required me to jump through a couple of hoops. After applying for an openSUSE membership, I didn’t get a response for months. a membership. I want to increase my involvement over the coming year. Last year I got my membership sorted out, but I needed to be very persistent! Its much easier to get kicked out, than it is to join. Which (in my opinion) is a problem for a community that relies on contributors. In my work as an IT architect, I have learned a few things about Marketing. One of these lessons was the notion of the customer life-cycle. You can read about this phenomenon here: (1), (2), (3). The idea is that businesses not merely try to get a customer to buy your product or service once, but that you try to keep them engaged so they come back. 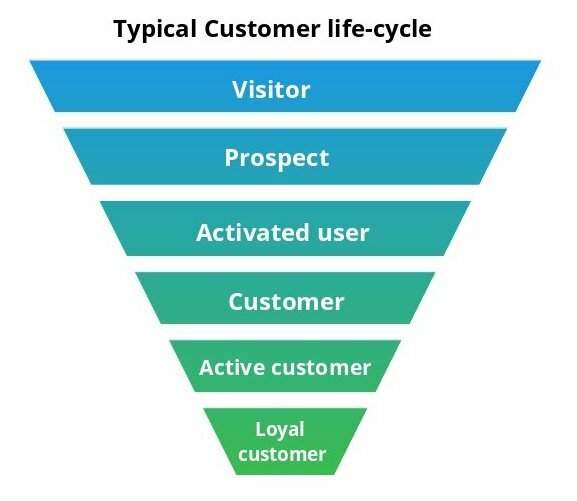 In a typical life-cycle, the customer first visits a site, then shows interest in a certain product or service. Before the customer is ready to buy the product, (s)he might want to evaluate the product/service first. This can be achieved by offering information or for instance a trial period. This leads to a first purchase by the the customer. Most businesses (think shops, supermarkets, restaurants, dealers, etc.) benefit from returning customers. This is why they try to service these customers as good as possible. If the business offers quality products / services time and time again and the business offers quality support and the business is well regarded in the market and the business keeps in touch with the customer, that person might become a loyal customer. Although communities have a different dynamic, there are certainly similarities. Lets discuss openSUSE for instance. Looking at the guiding principles, openSUSE wants to create the best Linux distribution in the world, which has the largest user community, and provide the primary source for getting free software. How to get openSUSE in the hands of more users? How to expand the openSUSE community? How to get more contributors to volunteer working on openSUSE? Suffice to say that Marketing is important to achieve these goals. openSUSE might want to use a similar life-cycle, made for the community. A typical Linux user might encounter openSUSE as the best KDE distribution, advertised in some kind of publication or podcast. This will raise awareness about openSUSE. The user wonders what makes openSUSE unique and starts looking for information. They will soon learn about all the great tools that openSUSE has (co)developed, such as YaST, Zypper, BtrFS, Snapper, Open Build Service, Open QA, Kiwi, Portus and Machinery. And they might want to give it a spin. They will need to learn how to do certain things. Maybe they try to use KDE Discover to update their software and things don’t work out. So they go to the forums and learn that they need to use YaST Software Management or Zypper. If they like the way that openSUSE is setup and how it works, they become active users. After a while, they start to help other users to get things done. This increases their involvement and they start wanting to give back to the community. In some communities it is possible to become a supporter by donating a certain amount on Kickstarter, Indiegogo, Patreon or Liberapay. In the openSUSE community, it is valued to participate in the project, so they become contributors. After they start enjoying working together with other Geeko’s, they might end up becoming core contributors to the openSUSE project. Maybe we need to look at the Journey of Linux enthousiasts from user to community member to contributor? Maybe we need to look at where people are dropping of. Maybe we need to look at the motivations of people to become an active community member or to become a contributor. So we can better target these people to engage with openSUSE. Looking at my personal Journey, I started being interested in Linux during my years in University, because I was tired of paying over and over again for the same software (especially MS Office). Software as a Service didn’t exist yet. When starting working in IT in 2009, I decided it was time to switch to Linux. I looked for a high quality distribution of European origins that looked familiar to Windows. So I ended up with openSUSE 11.1 and KDE 4.2 as my Desktop Environment. In the following years I learned more and more about Linux, openSUSE and all the cool free and open source software that is available. I started listening to podcasts (Linux Action Show, Linux Action News, Linux Unplugged). Via these podcasts, I was encouraged to go to open source conferences. So I went to FOSDEM in Brussels, which is pretty close to the Netherlands. This year (2019), I have attended FOSDEM for the 5th time. I have attended a lot of talks by Richard Brown / on openSUSE. Last year (2018) I started with my own website and posting articles on openSUSE and various applications running on openSUSE. So my personal involvement is increasing steadily. I am not a contributor to main parts of the openSUSE project, although that is likely to happen in the future. My Journey is not without bumps in the road. I have solved a lot of problems with openSUSE over the last few years. Problems such as programs that suddenly stopped working or encountering hardware related problems. Rolling back updates, adjusting / restoring configuration files, et cetera. Because of the great build quality of openSUSE, I managed to fix these problems. However, many less technically skilled people would have given up in the same circumstances. The same can be said of my efforts of becoming an openSUSE Member. I will likely try and try again. But many less motivated people would certainly give up in the same circumstances. For me, the email that I received last month is an indication that the openSUSE community can do more to retain its users. And that the openSUSE community should have a better ‘Marketing strategy’ (for the lack of a better term) to make the Contributor Journey a smoother experience. To try to get the roadblocks out of the way for the people that want to be informed or be involved. It is an area where I could see myself contributing to in the future. For more discussions on this topic, you can message me via Mastodon: @fossadventures@fosstodon.org.